Bradley Manning, the United States army soldier who leaked a massive trove of secret US government files to WikiLeaks, was on Tuesday acquitted of the most serious charge of aiding the enemy but was convicted of several counts of espionage. Manning, 25, the former army intelligence officer who was branded as both a whistle-blower and a traitor after he sent 700,000 secret government documents to WikiLeaks, was convicted of illegally releasing classified documents knowing they would be accessible to the enemy. The verdict is a striking rebuke to military prosecutors who argued that the largest leak in US history had assisted Al Qaeda. The verdict was handed down by Col Denise Lind, the judge at Manning's court-martial at Fort Meade. Lind found Manning guilty of most of the more than 20 crimes he was charged with, including five counts of theft, five counts of espionage, a computer fraud charge and other military infractions, the Washington Post reported. Lind, found Manning guilty of most of the more than 20 crimes he was charged with. She also acquitted him of one count of the espionage act that stemmed from his leak of a video that depicted a fatal US military airstrike in Farah, Afghanistan. Aiding the enemy was the most serious charge and carried a potential life sentence. He faces a maximum sentence of more than 100 years. His sentencing hearing is set to begin on Wednesday. In a closing argument at the court-martial, his lawyer, David Coombs, argued that Manning was "trying to ply his knowledge to hopefully save lives," was young and naive and thought he could make a difference. Military prosecutors said Manning was not a whistle-blower but a traitor. They said Manning knew that enemies of the United States use WikiLeaks as a resource, and they said some of the documents he released wound up in the hands of Al Qaeda. The prosecutors said Manning craved notoriety and put his fellow soldiers at risk. Among the items sent to Wikileaks by Manning was graphic footage of an Apache helicopter attack in 2007 that killed a dozen people in the Iraqi capital Baghdad, including a Reutersphotographer. The documents also included 470,000 Iraq and Afghanistan battlefield reports and 250,000 secure state department cables between Washington and embassies around the world. 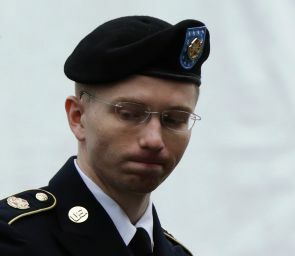 Manning had already pleaded guilty to 10 charges that carry up to 20 years in prison, plus a dishonourable discharge. But prosecutors pushed ahead with more serious counts, including aiding the enemy. Manning has been jailed at Fort Leavenworth since April 2011 and was at the military prison in Quantico, Va., for nine months before that. Among his defenders is Daniel Ellsberg, who in 1971 leaked what become known as the Pentagon Papers to The New York Times. Those papers showed that the government was systematically misleading the public about US involvement in Vietnam.